I believe in Jefus Chrift. 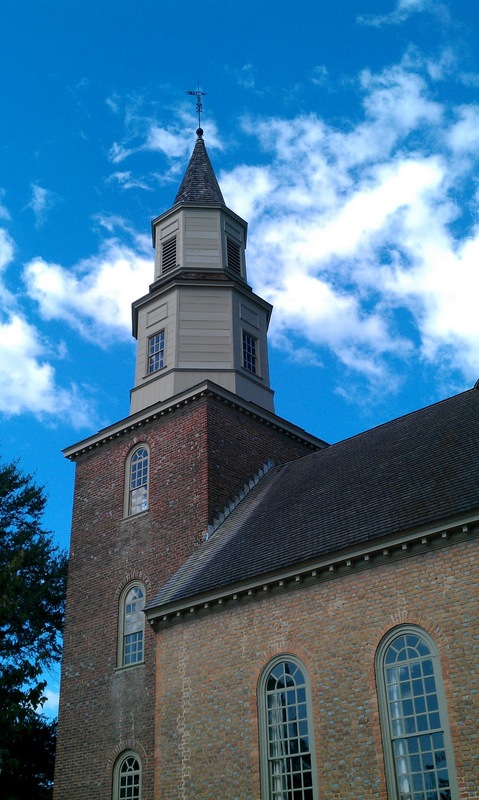 Inside the Bruton Parish Church in Williamsburg, VA. The church was founded in 1674, some 39 years after my family arrived in Virginia. Did they ever attend this church? I have no proof, but at the time there was only one church to attend if someone was so inclined, so it's quiet possible. Michelle and I walked the grounds of this church as if they were holy. We paused at graves, some of which were inside the building. We stared at simple things, like the door knob, the same one turned by Patrick Henry, George Washington, and Thomas Jefferson. I held the rope and asked to ring the church bell, the same one used to celebrate the repeal of the Stamp Act in 1766 and call worshipers today. At the front of the sanctuary I paused for a prayer beside a 400 year old baptismal font sent over from England. I thought about how simple faith and secret prayers inspired boldness to believe this world could be better; about the promises of eternity strengthening the decisions of today; and about English gentlemen bowing to the Jewish carpenter and trusting their future, and their children's, to Him.